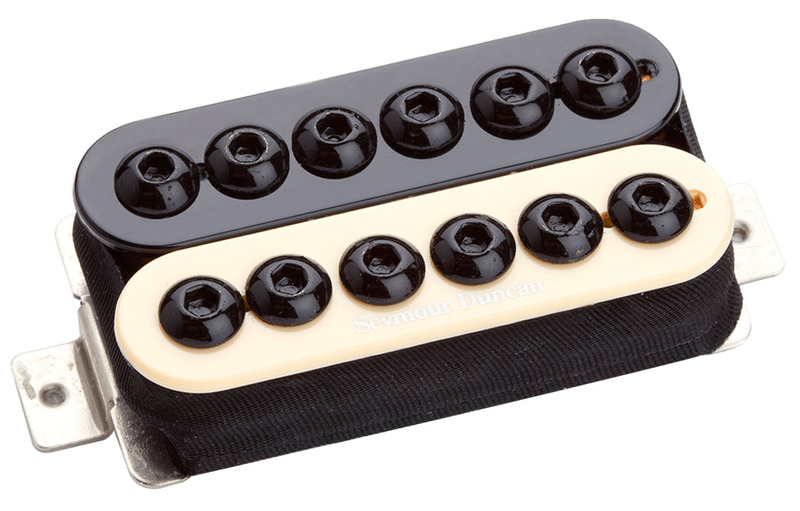 The Seymour Duncan SH-8n Invader Neck Pickup is an ultra high output humbucker built for aggressive playing styles. Recommended for punk, garage, thrash, metal and other heavy rock styles. The SH-8b is designed for the heaviest tones a passive pickup can produce. The combination of three ceramic magnets, over-wound coils and twelve black oxide cap screws make the Invader an electrifying force of energy. The wide magnetic field pumps power into your amp with a totally heavy sound. Comes with four-conductor hookup cable. Available for both neck (SH-8n) and bridge (SH-8b) positions - most commonly used in the bridge position. The SH-8n Invader neck pickup has considerably reduced output for tonal versatility. For all instruments. The wide pole pieces work for both humbucker and Trembucker string spacing. Players include Troy VanLeeuwen / Queens of the Stone Age (bridge), Mike Chlasciak / Halford (bridge), Whitey Kirst / Iggy Pop (bridge), Rick Jackett / finger eleven (bridge), Will Adler & Mark Morton / Lamb of God (bridge). Purchase and install this pickup and check it out with your own gear, in places you normally play - concert halls, the studio, your bedroom - wherever. If you are unhappy with the pickup for any reason, you can exchange it for another Seymour Duncan pickup of equal or lesser value within 21 days of purchase. You pay only shipping and handling costs and any price difference for the replacement pickup. A return authorization is required, and the pickup must be returned in good condition, with the original parts and packaging intact.